After her mother is shot at a checkpoint, fifteen-year-old Sarah--blonde, blue-eyed, and Jewish--finds herself on the run from a government that wants to see every person like her dead. Then Sarah meets a mysterious man with an ambiguous accent, a suspiciously bare apartment, and a lockbox full of weapons. 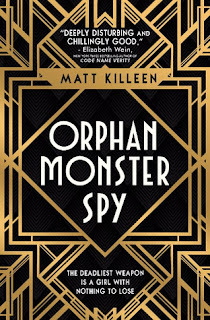 He's a spy, and he needs Sarah to become one, too, to pull off a mission he can't attempt on his own: infiltrate a boarding school attended by the daughters of top Nazi brass, befriend the daughter of a key scientist, and steal the blueprints to a bomb that could destroy the cities of Western Europe. With years of training from her actress mother in the art of impersonation, Sarah thinks she's ready. But nothing prepares her for her cutthroat schoolmates, and soon she finds herself in a battle for survival unlike any she'd ever imagined. Can you describe the Orphan Monster Spy series in five words? Probably not! 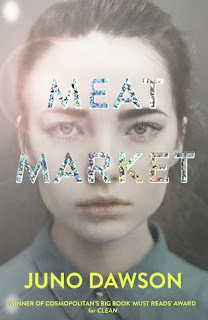 My US editor calls it Mean Girls meets Inglorious Basterds… but that may not cover the series. Same with Malory Towers with Nazis which always risked being a bit flippant. Maybe: war, fascism, abuse, resistance & survival. Mmm, I’m not sure any of them are very personable. Sarah lives in my head and she regularly sounds off about things, usually my lack of progress on her adventures, so I don’t really need to hang out with her on a voluntary basis. I do like Klose, the nurse, although I imagine that level of righteous anger could get wearing. Sarah’s mother, in her heyday, would have been good value, I think. I like giving Sarah coffee though. I treat her very badly most of the time and she needs some light in her life. Do you think you could have survived what Sarah did? While Sarah and I have some things in common, she’s really very much better at stuff than I am. She plays the piano and I learned the keyboard listening to The Cure, she speaks multiple languages and I struggle to order coffee in French. When I started Orphan Monster Spy I couldn’t walk without two crutches and even now I couldn’t match her physicality. Also, I might kid myself that I’m as brave and resilient as she is, but I don’t think fast enough to have survived. Yeah, basically I’d be dead. Most people would be. What was the most challenging part of your research for Orphan Monster Spy? You can discover facts quite easily. Finding the fuel tank capacity of a 1920s Mercedes, should be difficult, but the internet is a wonderful thing. Finding the emotional truth behind those facts is the real challenge. That means a lot of oral histories and interviews looking for that phrase or moment that addresses the whole. My hardest moment was watching a Simon Wiesenthal feature length documentary, Echoes that Remain I think. I was away on business, in a hotel room, alone and it was so raw that it got on top of me. I sat there, sobbing, big heaving, inconsolable tears curled up in one of those stupidly big American beds. What was the most interesting thing that you found while you were researching? I had always loved the symbol of the three hares, but to discover how universal it was? That blew me away. It has symbolism in Christianity, Judaism and other schools of thought. It can be found anywhere from Cornwall – where they are the Tinners’ Rabbits – to the Silk Road. There are associated rhymes in multiple languages. Truly fascinating. Ha. There are many, many things that I love about writing. The supportive community, particularly in children’s literature, is awesome. That, and all those other reasons sound better than this big one: writing a novel, the first draft at least, is solitary. If it’s good, bad or indifferent, that’s entirely on you. You make that world, you make it work, you create people to live in it and decide what they do. You can listen to feedback and advice, but in the end it’s your choice. Every other creative endeavour I’ve been involved in has relied on other people or things, for better and worse – guitarists, cameramen, account executives, money, the physical laws of the universe – but writing is you. You are the entire creation. All that changes when you get published of course, with lots of super-talented people steaming in to make it better, but that core experience is your fault and you can’t blame anyone for it. Or it’s ace and you did it. I’m working on a sequel to Orphan Monster Spy right now and that’s my big focus. Same spy, different monsters. I’m not sure what the future holds, but I’m not short of ideas, so I’m not too scared. I am…wistful, is what Dodie Smith would have called it. No list of the women who made me is complete without my princess. Yes, she’s a princess and I get that’s a problematic trope, but this is no typical damsel in distress or Disney princess – even though, now, she literally is. She’s a politician and a diplomat. She has authority. She’s also a resistance fighter against an overwhelming and malevolent totalitarian dictatorship. She may have been adopted into wealth and privilege, but she has made all that work for her in defence of the oppressed and vulnerable. She’s the ultimate ally. She is captured, red-handed, by the Empire’s most dangerous individual and can only expect abuse and death. Yet she stays calm and tries to brazen it out with an aura of appalled and condescending innocence. She is tortured for vital information – and refuses to respond to threats or invasive interrogation methods. She watches her home planet get destroyed, with millions of people murdered, as the result of a double-double cross that she must have relived over and over again in the hours that followed. Then the door of her cell opens, and she makes fun of the Stormtrooper who is presumably there to take her to her execution. That’s some woman right there. Yet, she’s also a woman of compassion. She comforts Luke on the apparent death of his mentor without judgement – even though she’s watched her father and her people executed just a few hours earlier. She accepts Han’s apparent betrayal as just one of those things – it’s his path, no one else can choose it for him. That’s very generous of her as his departure will inevitably cost lives. I was five years old when I first saw Star Wars at the cinema and it was a watershed moment for me, in every conceivable way. It’s difficult to calculate how important this depiction of women was in my cognitive development. Strong, smart, opinionated, right about most things and not taking anyone’s crap. I saw that this was what women could be – should be – in sharp contrast to some of the real world events I was witness to at the time. Her character continues in that vein for the whole trilogy. She is calm and decisive in the Rebellion’s darkest hour, willing to sacrifice herself to allow the transports to escape. She struggles a little with a sexual harassment issue, but this is resolved by the time she bluffs her way into a gangster’s den to rescue the man she loves, by playing chicken with a thermal detonator. When she fails she allows herself to be captured and humiliated in order to affect that rescue later. Then she goes to fight on the ground with her troops, a leader that won’t ask anyone to do anything that she isn’t willing to do herself. Finally, when she discovers one of her best friends is, in fact, her brother, she rolls with that as well. She doesn’t beat herself up about what she may or may not have done or felt. By the time of Episode VII, she could be allowed some vulnerability, having fought evil for more than 40 years, losing a son and a husband along the way. We’ll also forgive her the moment of racism – “get this walking carpet out of my way” – as she was under a lot of stress at the time and I suspect she regretted it shortly afterwards. Actress Carrie Fisher struggled with manic depression, plus various substance addictions all her life, an understandable result of being born into a famous family, becoming one of the world’s most famous women at 21 and suffering the insidious abuse that Hollywood actresses went through in the ‘70s and ‘80s. Her behaviour had been erratic and occasionally unpleasant in the past, but she had come to a place of peace, health and generosity in her final years. Those who met her then, found she embodied much of the famous princess. Meeting Carrie Fisher felt like coming home. In a sidenote, I misheard one of her early lines as, “the senate will not forestill for this.” For some 30 years until I saw a DVD with the subtitles on I was convinced that “forestill” meant tolerate. Apologies to those who may have had to deal with me using that word in a sentence prior to 2008. You were all very kind. 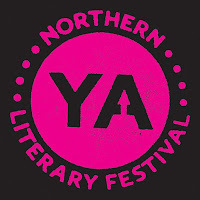 Matt Killeen will will be taking part in the Feminism in YA panel with Katherine Webber, Annabel Pitcher, and Lauren James, to celebrate the Centenary of the Woman’s Vote, discussing their inspirations, and the empowering characters they have created. Fantastic questions Cora, interesting to learn more about the book! I've never seen Star Wars, but I do like watching interviews with/reading about Carrie Fisher. She sounds incredible. Thank you :) It wasn't until recently that I'd even seen star wars! Loved this post Cora. I'm hoping to get this one read soon.